Below, we have featured the difference in the dental implants cost in Sydney and Thailand with an intention to answer all of your questions regarding the implants and all of the costs associated with it. In Australia, the implant procedure is carried out using dental implants made out of Titanium, a lightweight and non-magnetic meat used in several surgical procedures. This metal is non-corrosive and will not be rejected by your body. Hence, the success rate of placing dental implants made of Titanium is 95 to 98%. Dental implants are the most natural looking of all tooth replacement options, in addition to being the most functional and effective in comparison to dentures and bridges. However, we have a lot of clients who are quite apprehensive of implants being out of their price range. Tooth implants are typically more expensive than any other traditional alternatives. Some people are just not ready for the significant financial cost of dental implants and choose to go for other procedures. Dental implants are an expensive procedure, but what most people should try to understand is that in the long run, dental implants have a longer life and are more cost efficient as against the older options like caps, bridges and dentures. Dental implants offer superior stability and replicate your entire tooth structure and not just the crown. In comparison to bridges and dentures which may require frequent visits to the dentist and additional expenses, dental implants do not need occasional relining or replacement. Dental implants are very easy to maintain and don’t have the risk of damaging surrounding teeth. They also fit more comfortably and naturally and even look better cosmetically which can improve your self-esteem. Dental implants allow patient to eat hard foods with confidence. The tooth implant cost in Sydney depends on a number of factors including the type of implant and procedure, how many and which teeth you need to replace, how many implants are required to support these teeth, how much insurance coverage you have and your geographical location. Tooth Implant Sydney, as your trustworthy dentist, provides quality dental implants for the right price. When it comes to dental implants, we only use Australian approved brands. Our implant dentists are well trained and experienced. 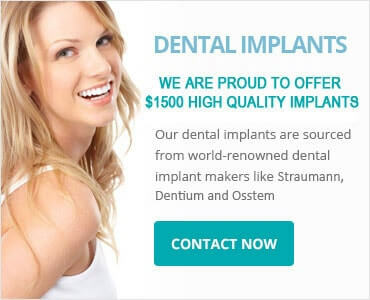 At Tooth Implants Sydney, we provide the lowest possible dental Implants cost. We feel it is important that our patients do not experience hidden fees, or fees for unexplained procedures, and we are happy to provide you with an accurate dental implants price estimate. Dental implant prices in Sydney can be extremely high when compared to the dental implant price in other countries. This difference has led to the emergence of dental tourism and some people opt to travel to foreign countries to take advantage of their cheaper prices for tooth implants. Looking around for cheap dental implants is not recommended. This is a very complicated process only to be performed by dentists and specialists with extensive training, and not something you’d want to risk.Are you looking for affordable & high quality dental implants in sydney? Call US Today at 1300 850 072. We offer dental implants for $1500 and crowns made in australian labs for $1350 which means you can have a new tooth for $2850. There are no hidden costs ! When it comes to dental implant cost, there are several treatment options available to choose from depending on the complexity of your problem. There are different solutions to support a single or multiple Teeth or to replace the whole set of teeth that you have on your lower or upper jaw and all these teeth can be supported by four, five or six. Dental implant fitted with a crown is an ideal and long-lasting option to restore missing tooth. Replacement of single missing tooth using an implant requires involves multiples visits which includes consultation and planning, initial examination, imaging of the tooth, reviewing dental history and discussion about your treatment options. Placement of dental implant and a temporary tooth till the dental implant integrates with your natural bone. Unlike other treatment options, replacing multiple teeth using affordable dental implant in Sydney gives your teeth a level of fit, feel and functionality. Replacing multiple teeth using dental implants requires multiple visits which involve consultation and planning, initial examination, imaging of the tooth, reviewing dental history and discussion about your treatment options. Placement of dental implants and temporary teeth till the implant gets integrated with natural jaw bone to form a string foundation. You can return to your work or resume you normal activity the next day and any discomfort can be treated with pain medication. Placement of fixed, implant supported bridge or custom-made crowns. The procedure is also the same for all-on-4 dental implants. Does Dental Insurance Cover the Cost of Dental Implants? Most insurance companies like to cover the cheapest option and as a result they tend not to cover dental implants. This trend is changing, and more and more insurance companies are realizing the long-term benefits of implants and are now starting to cover them. Even though, we accept insurance coverage, we also offer convenient and affordable Dental implants cost in Sydney that may help you to finance your dental implant needs. What are the risks of dental implant surgery? Talk with your implant dentist before any procedure to discuss your health history and habits and to fully understand the risks involved. Affordable dental implants in Sydney, which have been used for decades, are proven to be safe and effective. Unlike natural teeth, dental implants are not susceptible to dental disease such as decay; however, the health of the gums is vital to maintaining lasting implant success. Proper home care by the patient and regular professional cleanings and check-ups are essential elements for dental implant sustainability. Each patient is different, and success relies upon diagnosis and planning, medical history and a variety of other factors. What are the Benefits of Dental Implants in Sydney? Can I choose a general dentist to place my dental implants in Sydney? NO! There are a few general dentists who advertise themselves to place dental implants. But, getting your dental implants done by a general dentist would not be as effective as the procedure done by a specialist. Only a certified implant dentist who has specialised knowledge on dental implants should perform an implant surgery for more effective results. They possess specialised tools and knowledge to get the job done right in a short period of time with a lesser rejection rate. Can I find affordable dental implant procedure in Sydney? Why dental implant cost in Sydney is very high? For decade, dental implants are possibly the most exciting news in dentistry. With dental implants, it is now possible to replace a tooth or multiple teeth and possibly keep it for the rest of your life. The varied treatment options and other factors like the number of teeth to be replaced, the type of material used in the manufacturing of implants and more can affect the total cost of implant procedure. Also, if there is no enough jaw bone to place your implants, bone grafting should be done prior to the implant procedure and this also adds up to the total implant procedure cost. What are the different ways to find affordable dental implants in Sydney? If you are looking for low cost dental implants in Sydney, here are the best ways to get the most-durable and natural-looking teeth replacement solutions at an affordable cost. Discuss your dental implant needs and options for treatment with your dentist. Discuss about the type of option they will provide to make your treatment more affordable, such as payment plans or phased. What are the different factors that affect the cost of dental implants in Sydney? The amount, quality and location of the jaw bone. The number of teeth you have replaced and what type of artificial teeth would be used. The type of implant used to replace the missing teeth. The geographic location of your dental service provider in Sydney. Since dental implant is considered as a cosmetic procedure, most of the dental insurance will not cover the cost of surgically inserting your implants. But, there are a few dental insurance providers who are beginning to include it and they will cover a part of the cost of the restoration procedure. Depending on different factors, from number of the implants to be placed and the type of implant procedure done, the cost of dental implant in Sydney may vary. Tooth Implant Sydney offers dental implants for $1500 and crowns made in Australian labs for $1350 which means you can have a new tooth for $2850.